The big news for 1993 regarding Ford pickups -and indeed the entire pickup community-was the unveiling of the SVT F-150 Lightning high performance pickup. Born from the roots of Ford's Special Vehicle Operations (SVO), the Special Vehicle Team (SVT) was new for 1993, and the Lightning was one of their first projects. This inaugural offering was only available as a regular cab short box with a styleside bed and two-wheel drive, and folks could have any color they wanted, as long as it was either red or black. A monotone paint scheme and special front fascia with integrated driving lamps made the Lightning stand out from the rest of the F-150 line in a bold manner, and if that wasn't enough, the Lightning decals on the bed erased all doubts. Often referred to as "a Mustang GT with a cargo bed," the Lightning featured a high-output version of Ford's 5.8 liter V-8 engine. With high-flow GT40 cylinder heads, improvements to the intake and exhaust manifolds, and a less restrictive exhaust system, the beefed-up engine made 240 horsepower and 340 lb-ft of torque low in the rev range. 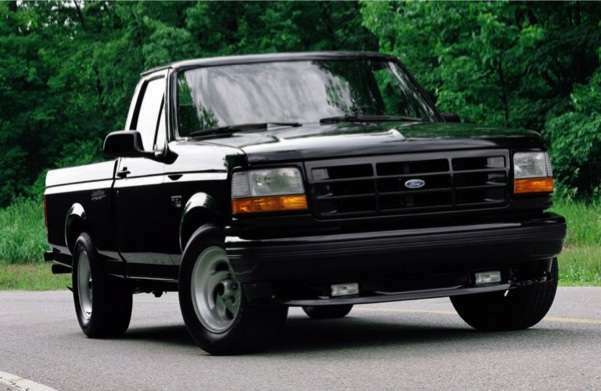 Hooked to a specially tuned 4-speed automatic (the only transmission offered), the 1993 SVT F-150 Lightning could hit 60 miles per hour in approximately 7 seconds and trip mid-15 second quarter-mile passes, making it more than a match for the all the other trucks and numerous sports cars of its day. The Lightning treatment didn't stop with a big engine. SVT engineers also tuned the suspension with thick stabilizer bars, lowering springs, and performance gas shocks (a pickup truck first) to significantly increase cornering grip while reducing body roll. Special 17-inch aluminum wheels (also a pickup first) utilized fat 275/60-series rubber for traction, allowing the Lightning to bite corners with the same fervor as that of a Mustang GT. Special sport seats with adjustable lumbar and side bolsters kept occupants glued into place, and in keeping with the Lightning's pickup truck utility, it was still capable of carrying over 700 pounds in the bed and towing loads over 5000 pounds. And despite its niche market and $21,000 price tag, Ford sold 5,276 Lightnings for 1993. The SVT Lightning wasn't the only story for 1993. The Nite edition didn't return to the lineup after just a two-year run, and XL replaced Custom as the base trim level. Standard Cab, Super Cab, Crew Cab, and Flareside models were carried over from 1992 unchanged, as were the engine choices for the entire F-Series line. The 4.9L inline six-cylinder was standard, and a range of V-8s including the 5.0L, 5.8L, and 7.5L were optional. The 7.3L diesel was available both in turbo and naturally aspirated form. Due to a change in horsepower calculations, the regular 5.8L engine was rated at 200 horsepower, down from 210 in 1992. Electronic cruise control replaced the mechanical controls of previous years, and all trucks (including the Lightning) continued to offer rear anti-lock brakes as standard equipment. Transmissions included the 3 and 4-speed automatics as well as 4 and 5-speed manuals. For 1993, cruise control was now an electronic system with the ability to increase or decrease speed by 1mph when the accel or decel buttons were tapped. As with the previous models, rusty oil pans leading to oil leaks are a common issue for these trucks, as are the automatic transmissions which can exhibit torque converter shudder and minor to moderate slippage. Major recall issues include the fuel pump (ID #24716), parking brake (ID# 44784), and the electronic cruise control (ID #53228), the latter of which can catch fire with no warning. Despite these deficiencies, the F-Series remained the best-selling vehicle in America for 1993. Available interior colors for '93 include Crystal Blue, Scarlet Red, Dark Charcoal, and Medium Mocha. The clearcoat metallic colors Iris and Electric Red were only available on Flareside trucks.